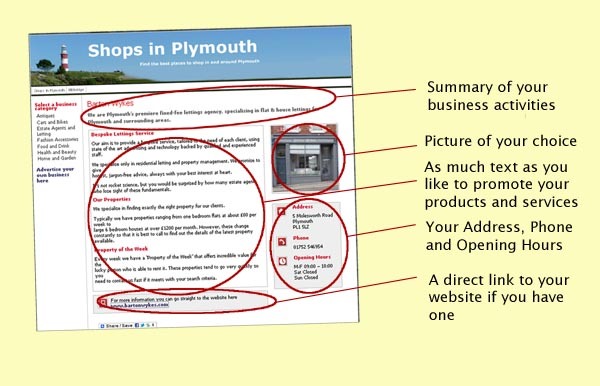 If you have a business located in or near Plymouth, this is an ideal place to advertise it. You can have your full page advertisement, for less than the price of a daily paper. Your Business Name, Address, Phone Number and Opening Hours. As much text as you like to describe the features of the business, special offers, services, menus, etc. A direct link to your website (if you have one). If not we can help you create one very quickly and cheaply. Monitoring of your visitor numbers. This basic package costs only £7.00 per month, with one month FREE when you sign up for a year at £77.00. Complete the form below to get the ball rolling and claim your own webpage.